Okay, so maybe the title of this post is a little misleading, as we're not officially a family four quite yet. Technically though, any time Robbie and Essley accompany me, there are four of us (because this little guy in my belly, by default, goes everywhere I do), right? And although we admittedly haven't done much planning this time around in comparison to my first pregnancy, when we are thinking ahead (which we really were on this stroll that you're seeing in these pictures), we are a family of four already. One of the biggest things on our thinking ahead/"need to figure out" list has been our stroller situation. When Robbie is on the road, Essley and I go for walks everyday (weather permitting). And when Robbie is home and I'm working, he takes her for daily walks as well. Our stroller has without a doubt been one of the most used baby/kid items we own - from these walks to travels to everyday shopping. 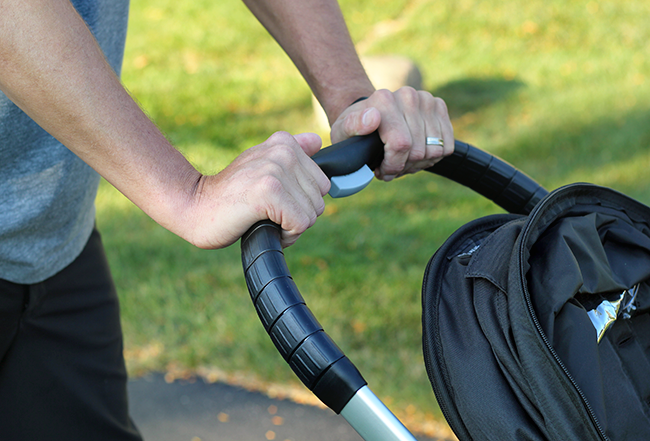 So when we started thinking about necessities for baby #2, one of the first things that came up was our stroller situation. Getting another stroller just for him and trying to cart around two strollers didn't seem practical, especially considering the fact that it's usually just one of us walking with Essley while the other is at work. So after some research, we realized that a double stroller was going to be the way to go. 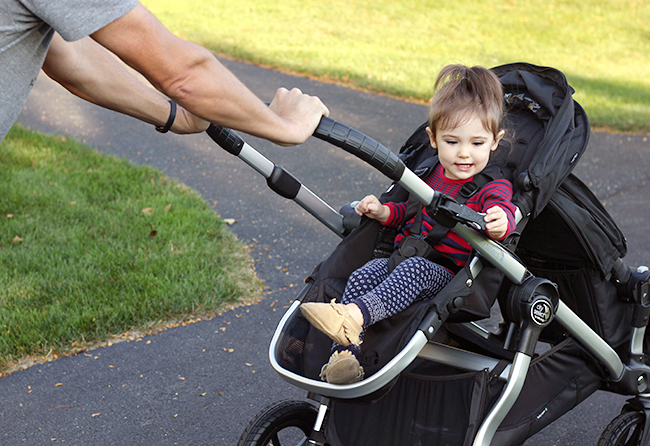 We wanted something adaptable though, that would also work as a single stroller and that would grow with the kids. And thankfully, we found just that. 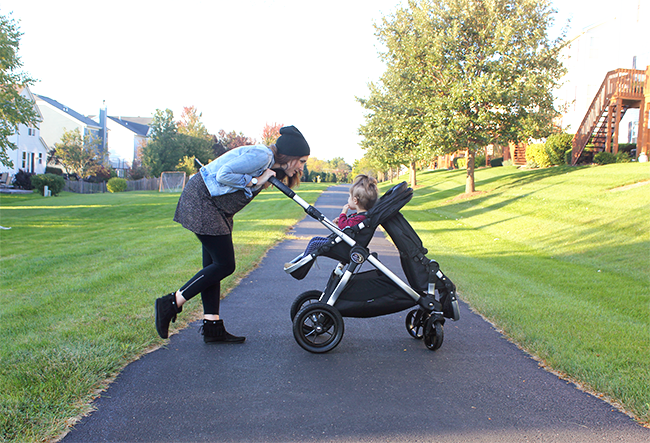 I'd heard a lot of really great things about a stroller from Baby Jogger called the City Select, and after looking into it some more, we decided that this was the perfect choice for our growing family. And I'm so glad we did. It was incredibly simple to put together, it's well constructed, it's aesthetically attractive, and it's so, so versatile. (There are sixteen possible configurations for this stroller you guys. Sixteen.) 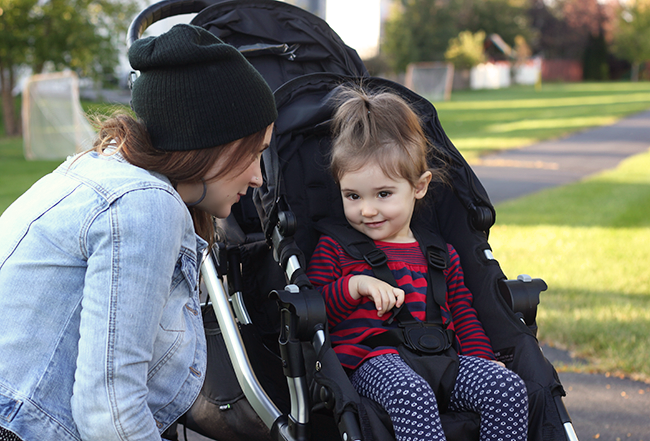 We've been using it as is (as a single stroller) nonstop for Essley over the past couple of weeks, but we've also been practicing the other ways we'll use it once our son is born. The car seat adapter is pretty genius - we can just snap his infant car seat right into place and use it as a pram/buggy while he's still little, even while Essley is riding in the stroller seat in the front. 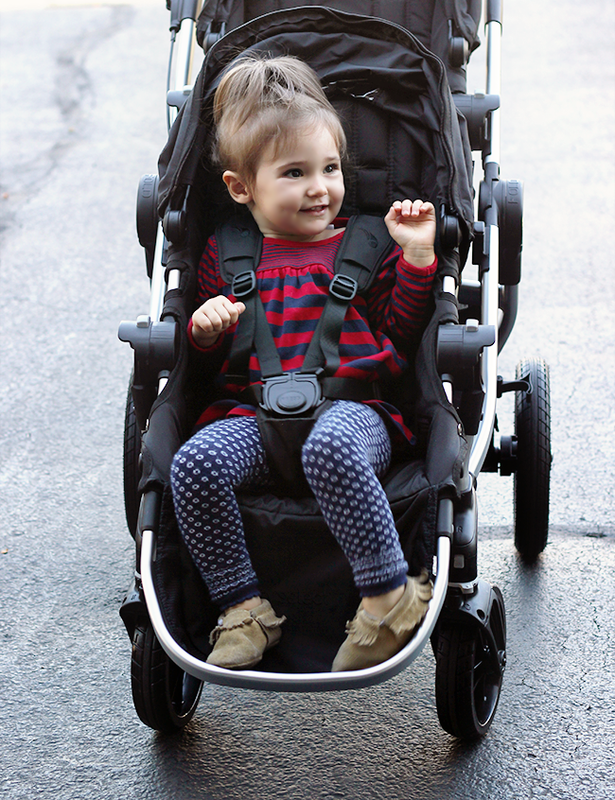 We also got the second seat kit, which will allow both kids to use it as a stroller at the same time. Even that comes with different choices - you can face both seats forward, or face the kids toward each other. (I am already envisioning how much easier this will make our lives when we're traveling, especially at airports.) Another thing I love about the City Select is that it's easy to push (it's got some seriously sweet all terrain wheels, and adjustable handle bar, and the thing practically glides on its own), and it's a breeze to collapse, throw in the trunk of our car, and set up again. Oh, and did I mention the nice large basket underneath? So handy. 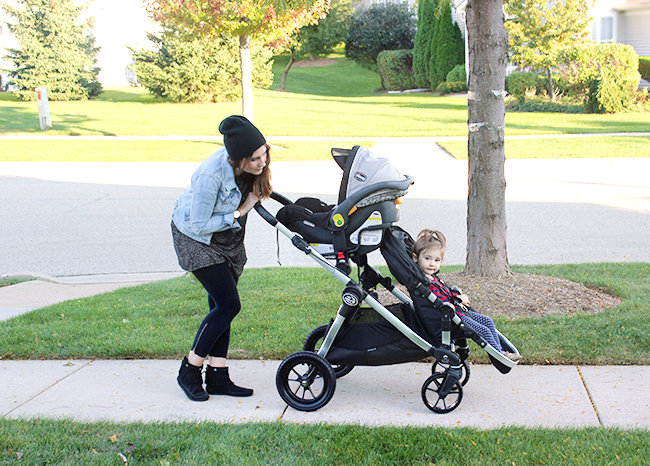 The other day the sun came out for the first time in a week, and we decided it was the perfect day to take our City Select for a spin around the neighborhood - with first the car seat, then the extra seat, attached. I'm fairly certain we got some confused looks from passerbys (perhaps we should have put one of Essley's dolls or stuffed animals in the extra seat for added amusement), but we didn't care. It was fun to pretend and to practice for our time as a family or four, which will be here before we know it. I honestly can't wait to take walks like this together on a regular basis, and I'm so grateful that we have our City Select to help make them even more enjoyable. Do any of you own a City Select? Can any of you suggest other products we should be considering for when our little one arrives and we become parents to two? This post is in collaboration with Baby Jogger. Although I was not monetarily compensated, I was given product to review. All opinions are 100% my own. That does look practical! And looks like Essley is having fun riding in it! Adorable post! We had a Phil & Teds double stroller when Charlotte was born. It was VERY handy! I appreciated how narrow it was...mad navigating stores and crowded spaces easier. Hm: advice for what made having two easier: when your baby gets a bit older, getting two of nearly everything!! It didn't take long for Charlotte to want to take part in anything Ollie was up to. Hope you are feeling well and enjoying you autumn! I love both your and Essley's outfits and that stroller looks amazing. My sister has a City Select with the extra seat for her twins and she loves it. It makes life way easier when you have two or more. Thanks for your comments everyone! This stroller rules. Can't recommend it enough! I can't believe how big Essley is already!!! She is just so adorable!!! !